UNESCO listed Chandigarh's Capitol Complex and Sikkim's national park home to the world's third highest peak Mount Khangchendzonga among its World Heritage Sites, approving all three nominations linked to India this session. Today's approval comes two days after the ruins of Nalanda University in Bihar made to the elite tag at the 40th session of The World Heritage Committee meeting in Istanbul. This is the first time that any country got three sites inscribed in the Word Heritage List at a single session of the committee meeting, a Culture Ministry official said. Chandigarh's Capitol Complex: The Architectural Work of Le Corbusier, an Outstanding Contribution to the Modern Movement Chosen from the work of Le Corbusier, the 17 sites comprising this transnational serial property are spread over seven countries and are a testimonial to the invention of a new architectural language that made a break with the past. They were built over a period of a half-century, in the course of what Le Corbusier described as “patient research”. The Complexe du Capitole in Chandigarh (India), the National Museum of Western Art, Tokyo (Japan), the House of Dr Curutchet in La Plata (Argentina) and the Unité d’habitation in Marseille (France) reflect the solutions that the Modern Movement sought to apply during the 20th century to the challenges of inventing new architectural techniques to respond to the needs of society. Chandigarh's Capitol Complex is palace of legislative assembly designed by noted architect Le Corbusier and located in Chandigarh, India. It is part of The Capitol Complex comprises three buildings — Legislative Assembly, Secretariat and High Court. Designated as a UNESCO World Heritage Site in July 2016. Khangchendzonga National Park (India): Located at the heart of the Himalayan range in northern India (State of Sikkim), the Khangchendzonga National Park includes a unique diversity of plains, valleys, lakes, glaciers and spectacular, snow-capped mountains covered with ancient forests, including the world’s third highest peak, Mount Khangchendzonga. Mythological stories are associated with this mountain and with a great number of natural elements (e.g. caves, rivers, lakes, etc.) that are the object of worship by the indigenous people of Sikkim. The sacred meanings of these stories and practices have been integrated with Buddhist beliefs and constitute the basis for Sikkimese identity. Archaeological Site of Nalanda Mahavihara (Nalanda University) at Nalanda, Bihar (India): The Nalanda Mahavihara site is in the State of Bihar, in north-eastern India. It comprises the archaeological remains of a monastic and scholastic institution dating from the 3rd century BCE to the 13th century CE. It includes stupas, shrines, viharas (residential and educational buildings) and important art works in stucco, stone and metal. 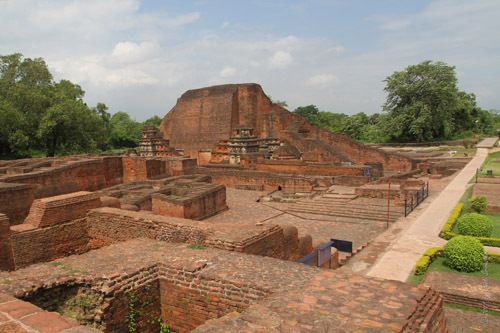 Nalanda stands out as the most ancient university of the Indian Subcontinent. It engaged in the organized transmission of knowledge over an uninterrupted period of 800 years. The historical development of the site testifies to the development of Buddhism into a religion and the flourishing of monastic and educational traditions.